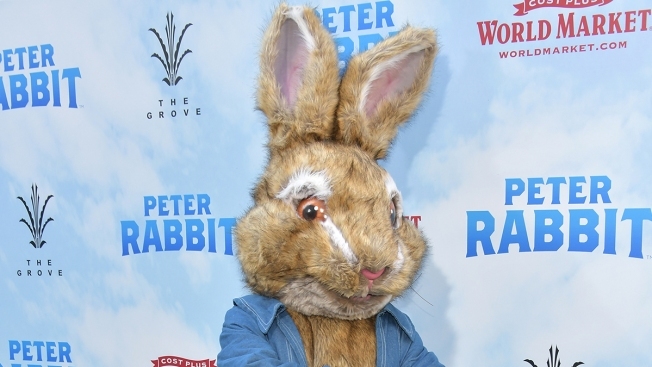 In this Feb. 3, 2018, file photo, Peter Rabbit attends the premiere of "Peter Rabbit" at The Grove in Los Angeles, California. "Peter Rabbit" filmmakers and the studio behind it are apologizing for insensitively depicting a character's allergy in the film that has prompted backlash online. Sony Pictures says in a joint statement with the filmmakers that "food allergies are a serious issue" and the film "should not have made light" of a character being allergic to blackberries "even in a cartoonish, slapstick way." In "Peter Rabbit" which was released this weekend, the character of Mr. McGregor is allergic to blackberries. The rabbits fling the fruit at him in a scene and he is forced to use an EpiPen. The charity group Kids with Food Allergies posted a warning about the scene on its Facebook page Friday prompting some on Twitter to start using the hashtag #boycottpeterrabbit. The group said that allergy jokes are harmful to their community and that making light of the condition "encourages the public not to take the risk of allergic reactions seriously." Kenneth Mendez, the president and CEO of the Asthma and Allergy Foundation of America, wrote an open letter to the studio Saturday asking for the opportunity to educate the company and the film's cast on the realities of food allergies and urged the studio to "examine your portrayal of bullying in your films geared toward a young audience." The studio and filmmakers say that they, "Sincerely regret not being more aware and sensitive to this issue, and we truly apologize."